TICKET RESERVATIONS NOW LIVE: Islam or Feminism – which one can truly liberate women? A date and venue is finally set for my debate with Julie Bindel and tickets can now be reserved – 28th November at the Institute of Education (London). Further details below. Please note that tickets are very limited, so book early to guarantee your seat and avoid disappointment. 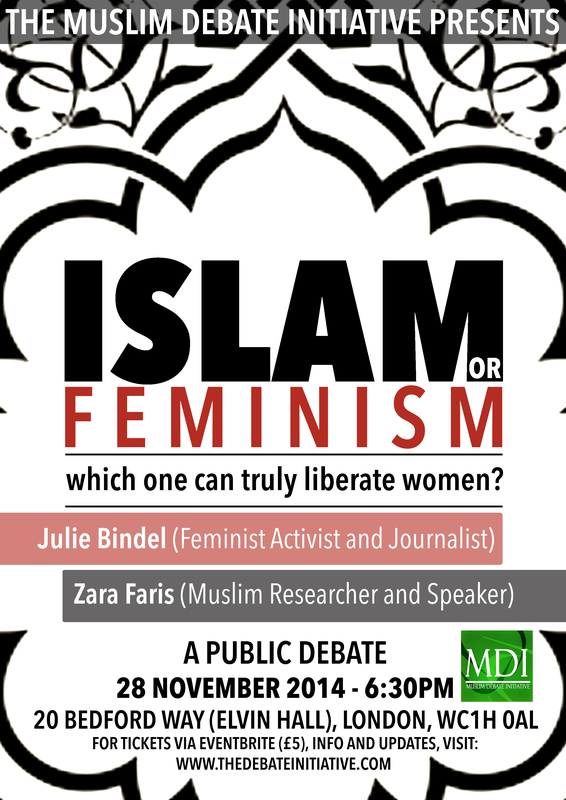 MDI BIG DEBATE: Islam or Feminism: which one can truly liberate women? Does Islam posit a viable way of life and solutions for women? Do women need feminism to formulate, understand, and support their position in society? Does a hybrid solution between Islam and feminism really make sense? Julie Bindel is a journalist, broadcaster, author and feminist campaigner, and is a founder of ‘Justice for Women’. She writes for the Guardian, New Statesman, Standpoint Magazine, The Spectator and the Sunday Telegraph, and has written articles on the issues of Muslim women. Zara Faris is a graduate in Arabic & Islamic Studies from SOAS University (School of Oriental and African Studies). She has lived for a year in Egypt studying the Arabic language. She is now a writer, researcher, and international speaker for the Muslim Debate Initiative.